Zeros 2 Heroes is an "incubator of one" that finds, finances, develops and deploys a compelling industry innovation every year. The ARGo engine turns social media metrics into actionable intelligence for entertainment producers of all stripes. The ARGo engine is the result of an ongoing process of research and development dedicated to a better understanding of advanced analytics as they pertain to the entertainment industry. ARGo distills complicated science into actionable intelligence able to easily inform the decisions of entertainment executives from across the industry. ARGo allows teams to not only set the initial strategy, but also react to campaign developments in real-time. Strategists can refine their work immediately in response to decisions based on real-time information. Analysts can then quickly ascertain the effectiveness of that approach and publish information on which their analysis is based. This tool provides timely information to the team itself, allowing better decisions to be made as the campaign progresses. Wanna Watch It is a social buying solution that reconnects audiences with theatres showing their favourite films. With the emergence of digital streaming technologies, VOD, and the competition from mainstream blockbusters, cinemas need to adapt their business model to attract larger audiences. While it is widely reported that movie attendance continues to be strong, theatres continue to report that nearly 88% of seats go unsold. Starting with independent cinemas, that are fighting to keep pace with the big chains but still act as a vital part of our cultural landscape, we are working to increase ticket sales through audience demand aggregation and dynamic content programming. Our premiere product, WannaWatch.It leverages cutting edge social technology to tap into audience sentiment and bring audiences back into independent cinemas in larger and larger numbers. We do this through aggregating audience taste, analyzing preferences, and converting this data into ticket sales. Doing so means more than just a better audience experience: it translates into increasingly optimized theatre inventories and a much better bottom line. Our system brings together the digital games kids love with the active and imaginative play their parents remember. At at time when concerns about childhood obesity, sedentary lifestyles and a pre-occupation with video games are at all time highs, Biba offers an elegant solution. Blending the digital games that kids have come to love with the physical and imaginative play that their parents want to see, Biba offers an entirely new form of family entertainment. Working with one of the world’s largest manufacturers of playground equipment, our team is designing a mobile play system that will change the way you look at childhood games. Fun and intuitive, Biba unlocks the imagination of the child and connects it to vigorous physical play that can be enjoyed solo, with their family or with any number of other children in the playground. Wearable technology and location-based stories come together to turn neighbourhood strolls into epic adventures. The Walkumentary project is a location-based storytelling platform for factual stories delivered through a Glassware App with downloadable content packs of interactive storytelling experiences that also functions as a content creation system for filmmakers. This technology has the potential to open up significant new markets for location-based storytellers by giving them access to new revenue streams from micro-transactions and downloads. With the ability to tailor content to the tourism industry, sports halls of fame, etc. while tying in branded commercial content, the Walkumentary project unlocks revenue potential across many different verticals. Full product available in 2015! An exciting new transmedia property designed to be experienced across the widest possible range of media platforms. 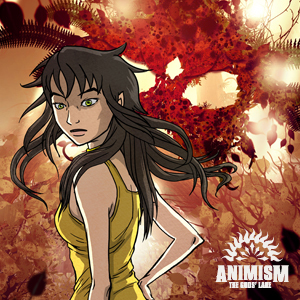 Animism is a landmark transmedia property that spans video games, short fiction, graphic novels, alternate reality experiences and a nationally televised animated series. Half Harry Potter and half Hunger Games, Animism is entertainment designed for young adults comfortable with a wide range of media channels. Now in development for its second ground-breaking season, Animism tells the story of Melody Ravensfall, a teenaged girl who discovers that she is the heir to mysterious ancestral powers that must be harnessed if the world is to be set aright. Audience members can follow her interlinked adventures across a matrix of media properties or as simple stand-alone epics. We tap into the wisdom of the crowds to identify the next generation of amazing genre entertainment properties. We are living in the heyday of genre entertainment, with comic-based blockbusters splashed all over the silver screen and new properties like Game of Thrones and The Walking Dead dominating audience ratings. As the popularity of such stories grows, so to does the supply of new concepts… making it increasingly difficult for producers to separate the wheat from the chaff. Our system uses a combination of advanced analytics and industry insight to identify weak but promising trends, establish their accuracy via targeted content, and fast-track development along the most promising lines. It’s a proprietary approach akin to “moneyball” that allows for the rapid creation of genre entertainment… giving a decided first-mover advantage to decision makers willing to embrace social media metrics. 30+ new genre entertainment properties already created! While we work with industry leading talent from around the world, Zeros 2 Heroes is led by a team of entertainment industry innovators. Throughout his career, Matt has concentrated on the creative direction and production of projects ranging from bleeding-edge mobile games to multi-platform television series to mixed martial arts spectaculars to nationwide comic creation campaigns. Matt was drawn to digital media during the "dot boom" of 90s and has seen it become an unrelenting transformative force... one that has redefined not just how organizations see themselves, but how they operate in the world. Matt has grown Z2H into an award-winning company whose work is recognized across North America. Ryan is an experienced digital media executive and producer. With a background in finance and his work with a portfolio of international client combined with his entrepreneurial undertakings, Ryan brings both strategic and creative expertise to product design, business development, and management. Formerly the Project Manager Director at one of Canada’s fastest growing retail companies, Mike oversaw the expansion of over 100+ bricks-and-mortar locations across Canada and the United States. Having made the switch to the digital media industry, Mike has worked on a variety of projects ranging from enhanced graphic novels to social media campaign management tools to bleeding-edge wearable technology apps. By leveraging his creativity and his people management skills, Mike has developed a proven track record of success. Bernie Clark spent his career as a senior executive at MDA, a world renowned leader in its field, best known for building the Canadarm and Radarsat 2—Canada’s radar remote sensing satellite. Bernie’s positions with MDA have included EVP and General Manager of the Remote Sensing Division. Bernie is also a noted author and speaker who has given talks on a wide range of topics connected to the intersection of environmentalism and science. Since the founding of the company, Bernie has helped guide the corporate development of Zeros 2 Heroes Media. Throughout his 30 year career, Paul has distinguished himself in a myriad of executive and creative positions across the entertainment industry. In addition to leading business affairs with Lucas Film and Hannah-Barbera, Paul has produced four feature-length animated films and was the Executive Producer of the live-action television series Earth: Final Conflict. As part of the executive team that launched Network Entertainment as a public company, Paul has now turned his energies to the production of acclaimed documentary feature films. Dr. Gregory P. Zeschuk co-founded Bioware Corp. in 1995 and went on to produce a series of genre-defining video game titles that include Baldur’s Gate, Neverwinter Nights, Star Wars: Knights of the Old Republic and the Mass Effect series. Following Bioware’s acquisition by Electronic Arts, Greg became a VP at EA and General Manager of BioWare’s Austin studio. In 2013, as a means of commemorating his contributions to the video game industry as a whole, Greg received the Lifetime Achievement Award as part of the Game Developers Choice Awards. If you want to work with our team, understand our methodology or have one of our partners speak at an industry event, please don’t hesitate to reach out. Thank you for contacting us. We will get back to you with in 1 business day.